I watched Super Bowl XLIX yesterday and was glad the game turned out to be more interesting than the ads running during breaks in the action. 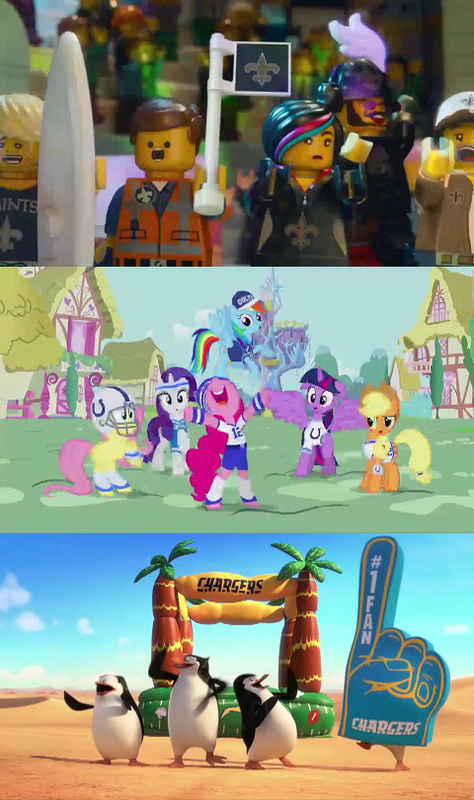 I did notice during an advertisement for the NFL’s “Together We Make Football” campaign, there were three groups of fictional characters from animated works shown cheering for different football teams: The Lego Movie for the New Orleans Saints, My Little Pony: Friendship is Magic for the Indianapolis Colts, and Penguins of Madagascar for the San Diego Chargers. That got me thinking about characters who have explicitly stated they’re fans of real-life sports teams in their series.